WISHTREND.com Event Result) 5 fans were chosen on wish facebook wall ! 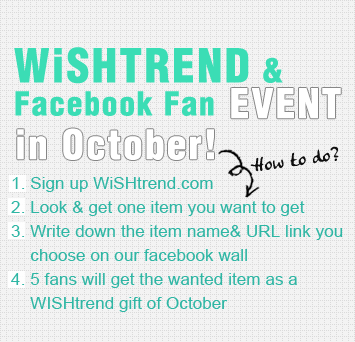 Many wishtrend fans joined the facebook event in October ! These are 5 fans to get WISHTREND GIFT. Thanks again and please remain the review after receiving our gift !! We will send e-mail to 5 selected fans soon. Then confirm the address, name, and product again. Our new event will be launched in November. Please join the new event again ! Esther Won Thank you for your review!! WISH Company Thanks for the comment ! Jeju volcanic mask will be good you you mom. 🙂 Have e good day ! Ciracle Enzyme Powder Wash is my choice. –> it sound like so good so cool~ i really want to try! WISH Company Thanks for the comments !!! Hope you can try it !! 🙂 Let’s share with your friends about our event ! it is so suit for me! i like bubble feel and it is gentle enough for daily use. WISH Company Thanks for the comment ! 🙂 wow it will be the good bubble item for you !!!!!!! WISH Company Thanks for the comment ! many U.S. fans luv namzia pouch ! the color is too lovely ! I don’t want my skin dark and look old!!! WISH Company Thanks for the comment ! GATZ sunscreen is amazing for avoiding UV ! Have a wonderful day ! I wish that I will win Ciracle Shiny BB Cream http://www.wishtrend.com/product.php?id_product=56.I want to try the effectiveness of this product. 회원님과 Ryan Soungho Park님이 좋아합니다. WISH Company Oh Great ! 🙂 Thanks ! Shiny BB cream will be best BB for you. Have a wonderful day ! WISH Company ‎@marissa lim : Thanks for the comments ! We really want to make you wish come true ! 🙂 Caolion pore minimizing pack, the biggest hit item in Korea ! I want GATZ Mr. SUN http://www.wishtrend.com/product.php?id_product=25because it’s very sunny here in Malaysia! WISH Company Thanks for the comment ! I know it’s sunny in Malaysia, Hope GATZ sunscreen will be a solution. I want De CAOLION Derma Blemish Cure Tonic http://www.wishtrend.com/product.php?id_product=110 please! Actually I want so many products that helps in curing and reducing my acne problem 😦 Please help me with my problem! I have been trying and changing so many types of cleanser, moisturizer, toner, etc. WISH Company Thanks for the comment !! 🙂 Have a wonderful day !